Baseball history is filled with accounts of memorable home runs. The Los Angeles Dodgers’ Kirk Gibson, for one, knocked a one-legged homer in Game One of the 1988 World Series against the Oakland A’s. The Pittsburgh Pirates’ Bill Mazeroski hit a dramatic round-tripper in Game Seven of the 1960 fall classic to beat the New York Yankees. Bobby Thomson ripped his “Shot Heard Round the World” in Game Three of the 1951 National League playoffs, leading the New York Giants over the Brooklyn Dodgers. Decades before those epic clouts came another great home run, hit September 30, 1927, at Yankee Stadium in the Bronx, New York. 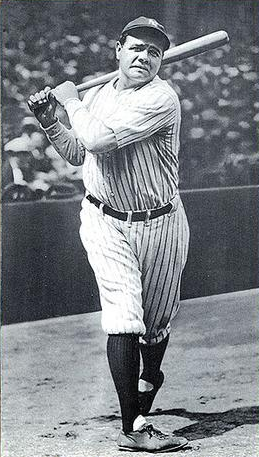 Yankees slugger Babe Ruth belted his 60th home run of the season, breaking the record of 59 he set1 in 1921. While it was a happy day for many given the magnitude of Ruth’s accomplishment, it was also a sad day for some. Baseball said goodbye to one of the greatest pitchers of all-time, Walter Johnson.2 The legendary Big Train was retiring after 21 seasons with the Washington Senators. On the mound for the Yankees (who were in first place by a whopping 18½ games) that day was right-hander George Pipgras, sporting a record of 10-3. The Senators (who were in third place and trailed the Yankees by 23½ games) countered with left-hander Tom Zachary, who had a record of 8-12. Both lineups were loaded with talent. The Senators featured Sam Rice, Bucky Harris, Goose Goslin, and Joe Judge. Of course, the Yankees boasted a lineup famously referred to as “Murderers’ Row.”3Earle Combs led off, followed by Mark Koenig, Babe Ruth, Lou Gehrig, Bob Meusel, and Tony Lazzeri in the two-through-six spots. The Yankees had clinched the pennant early in the month and were getting ready to face the Pittsburgh Pirates in Game One of the World Series on October 5. It was a relatively easy first inning for Pipgras as he quickly got a groundout and a fly out. Babe Ganzel singled, but Goslin popped out to Koenig at shortstop for the third out. In the Yankees’ half of the first, Combs flied out to left field and Koenig grounded out. Ruth drew a walk but was stranded after Gehrig’s groundout. Through the first three innings, the game was scoreless. Each team had managed just one hit. Things heated up offensively in the fourth inning. Goslin singled with one out for Washington, advanced to second base on Judge’s groundout to first and scored on Muddy Ruel’s single. Ruel then stole second and went home on Ossie Bluege’s base hit to make the score 2-0. Bluege stole second base but was left stranded when Grant Gillis grounded out. New York came back with a run of its own in the bottom of the fourth. Ruth led off with a single, followed by a base hit from Gehrig. Ruth advanced to third on the hit, while Gehrig went to second on the throw to third. Meusel hit a fly ball that scored Ruth and sent Gehrig to third. Lazzeri lined into a double play to end the frame. Goslin and Judge flied out to begin the Washington sixth. Ruel walked and made it to third after a pickoff attempt by Pipgras and subsequent error by Gehrig. Ossie Bluege walked, but Gillis flied out to end the inning. The Yankees tied the game, 2-2,in the bottom of the sixth inning. Ruth singled to right field with two outs and advanced to second on Gehrig’s single. Meusel followed with an RBI hit to score Ruth. Lazzeri popped out to end the rally. Herb Pennock, the Yankees’ ace left-hander, replaced Pipgras on the mound to open the seventh. He got Zachary to fly out and then gave up a double to Sam Rice. Bucky Harris walked, putting runners on first and second base. Ganzel grounded out, advancing Rice to third and Harris to second. Harris was then picked off second base for the third out. New York went down in order in the bottom of the seventh with Joe Dugan fouling out, Benny Bengough popping out, and Pennock flying out to left field. Pennock, in turn, retired the Senators in order in the eighth. Goslin and Judge grounded out, and Ruel flied out to left field. The game was getting late. Combs grounded out to third base to open the New York eighth. Mark Koenig tripled4 and up to the plate stepped the Bambino, Babe Ruth. In Ruth’s time with the Yankees, he had hit 366 home runs.5Now, he was ready to blast another record-breaker. Zachary delivered a low fastball7that Ruth sent into the right-field stands for number 60 on the year. It was also number 17 for the month of September and it gave the Yankees a 4-2 lead. 8Gehrig flied out to right field, and Meusel flied out to center field. The Yankees took their lead into the top of the ninth inning. Johnson subsequently asked for his release from the Senators. He still had the arm to pitch, but had lost the power generated from his legs.9 During spring training Johnson had suffered a broken ankle while pitching batting practice.10 While he somewhat recovered, the injury reduced the power generated from his legs. Despite his arm remaining sound, Johnson realized the end was at hand. “The leg I broke bothers me a lot, and not where it was broken. You see, when the legs are bad and you lose the old 'zip' on the ball, you find pitching a lot harder and you find you are not effective.” 11 The Big Train went just 5-6 with a 5.10 ERA in his final season. Certainly, for baseball fans of all ages and eras, September 30, 1927, was a day to remember. In addition to the game story and the box-score sources cited in the Notes, the author consulted the Baseball-Reference.com and Retrosheet.org websites. 1 Ruth Breaks Record: Yanks Win, Portsmouth Daily Times, October 1, 1927: 12. 2 Johnson would end his career with 417 wins, 110 shutouts, and 3,509 strikeouts. 4 “Record-Making Homer Breaks 2-2 Deadlock in the Eighth Inning; Babe Also Scores Three Runs, Bridgeport (Connecticut) Telegram,October 1, 1927: 31. 5 “8,000 Fans Thrilled as Bambino Leans on Ball Hurled By Tom Zachary,” Appleton (Wisconsin) Post Crescent, October 1, 1927: 12. 6 Cliff Corcoran, “99 Cool Facts about Babe Ruth,” http://si.com http://www.si.com/mlb/strike-zone/2013/07/12. 7 “Babe Ruth Cracks His 60th Home Run,”Lincoln (Nebraska) Evening Journal, October 1, 1927: 9. 8 Ruth’s 17 home runs in September set a new record for most home runs hit in one month. 9 The Evening Journal Wilmington Delaware May 13, 1926: 18. 10 Henry W. Thomas, Walter Johnson: Baseball’s Big Train (Washington: Phenom Press, 1995), 292.